Scheduled for release in the fall, Ode To Sunset is a fiction about dying and death, about a poet who is not quite Charles Baudelaire, not quite Charles Bukowski, who looks like a well worn Alex Trebek but with the demeanor of a Mickey Rourke, and takes place mostly in a city not quite Frisco. It is satirical, playful, and inevitably deadly serious. Episodes from this raucous irreverent allegorical tale of a man and his muse are still available for viewing at odetosunset.com. In the coming months leading up to the publication of Ode To Sunset, excerpts from the final section will be posted at regular intervals to build on the suspense to the outcome of a year in the life of an American genius, the conclusion of which will only be available in the print edition. This is not a roman à clef! Ode To Sunset is primarily a work of the imagination, meaning lies and made-up stuff. No actual poets were named in the writing of this fiction with the exception of dead poets who serve as historical or literary markers as is often required of dead poets. A small number of this very rare chapbook has recently been recovered from the storage locker of a prominent Bay Area bookseller. Published in 1973 by Cranium Press, handset in Goudy types and printed on an Albion hand press by master printer Clifford Burke in an edition of three hundred, they are an exquisite example of Burke’s conception of how a poem should appear on the page. 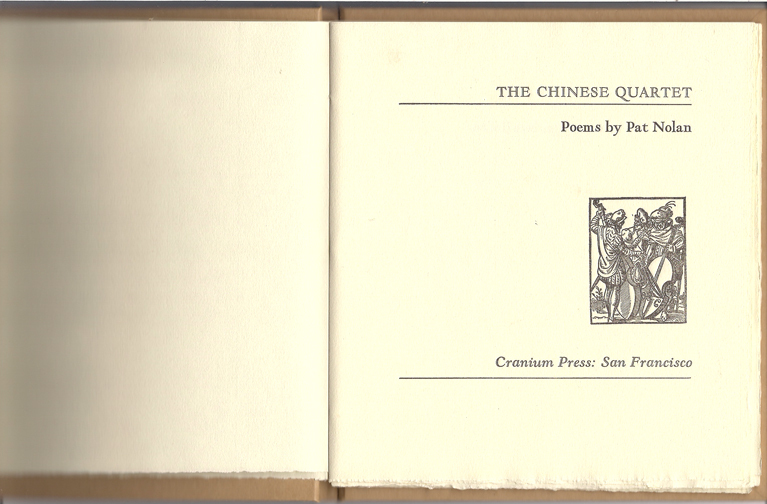 The sixteen poems by Pat Nolan, printed on the rag paper ends from a larger Book Club of California job, represent Nolan’s early experimentation with ideas adapted from Chinese and Japanese prosody. 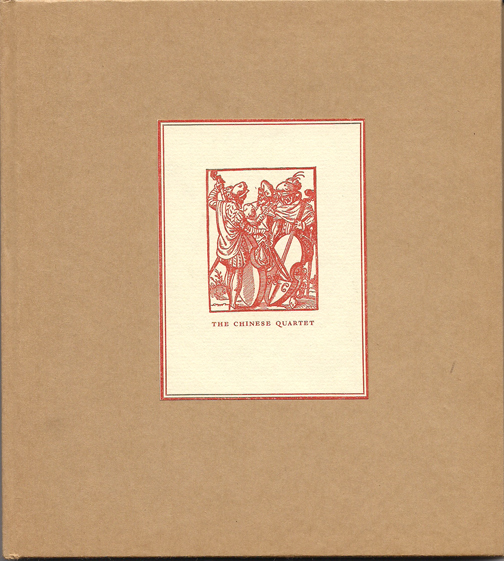 The austere brown paper wrapper is offset by the red centered label depicting a group of Renaissance musicians; that it represents a trio, not a quartet, is, in fact, an inside joke. The book measurements are 7.5×6.75 inches (19×17.1 cm). 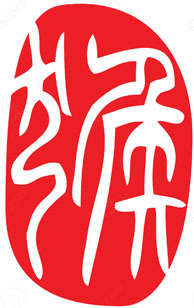 Signed copies of The Chinese Quartet are available for purchase at $50 each and include free shipping in North America (otherwise international rates apply). Cash, checks, or money orders accepted. See How to Order for more information. 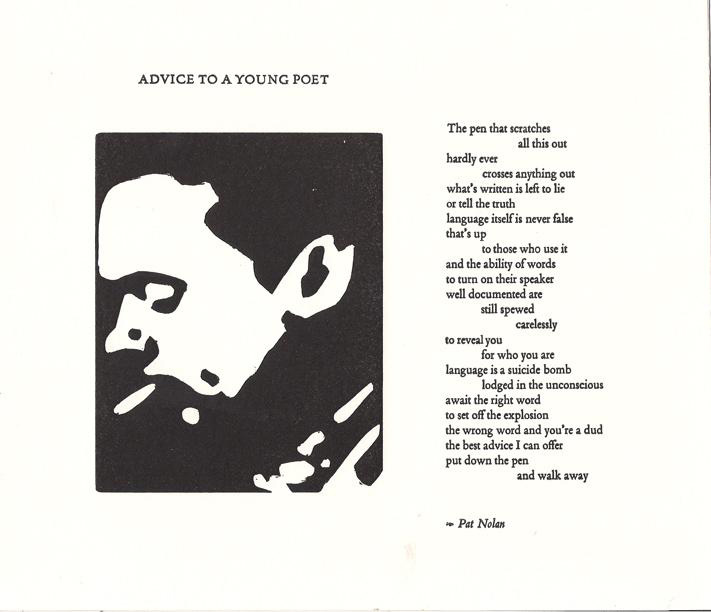 Still available for FREE from Nualláin House, Publishers is a limited edition letterpress broadside of Pat Nolan’s poem Advice To A Young Poet and his original linoleum cut of Dylan Thomas from the Smoking Poets series, printed by Eric Johnson of Iota Press on a Vandercook proof press. Send your request, along with $2 for shipping and handling, for this limited edition broadside printed on the occasion of Nolan’s reading at the Iota printery upon the publication of his latest collection of poems, Your Name Here. Broadside measures 10×8.5 inches (25.4×21.6 cm). A reminder to take a look at Nualláin House, Publishers’ allied sites, Parole, the blog of The New Black Bart Poetry Society, and Ode To Sunset, A Year In The Life of American Genius, an online serial fiction.